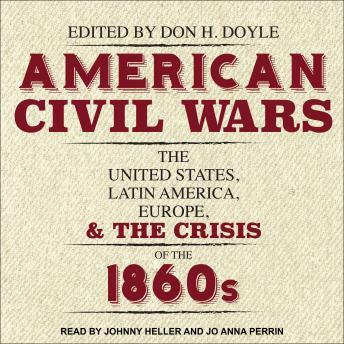 American Civil Wars takes listeners beyond the battlefields and sectional divides of the U.S. Civil War to view the conflict from outside the national arena of the United States. Contributors position the American conflict squarely in the context of a wider transnational crisis across the Atlantic world, marked by a multitude of civil wars, European invasions and occupations, revolutionary independence movements, and slave uprisings-all taking place in the tumultuous decade of the 1860s. The multiple conflicts described in these essays illustrate how the United States' sectional strife was caught up in a larger, complex struggle in which nations and empires on both sides of the Atlantic vied for the control of the future. These struggles were all part of a vast web, connecting not just Washington and Richmond but also Mexico City, Havana, Santo Domingo, and Rio de Janeiro and-on the other side of the Atlantic-London, Paris, Madrid, and Rome. American Civil Wars creates new connections between the uprisings and civil wars in and outside of American borders and places the United States within a global context of other nations.